This course has 13 finger exercises, 7 problem sets, 1 mid term quiz and 1 final exam. This was one of the best programming course that I have taken so far. Not only you will learn how to program but you will also get good overview of computer science concepts in general such as Algorithms, Recursion, Debugging, Assertions and Exceptions, Efficiency and Orders of Growth. This course will give you enough confidence to move on to more advance courses like how compilers work, operating systems, data structures & algorithms etc. Learning the basics and syntax of any programming language is important but in order to be a better programmer you have to understand these core concepts. 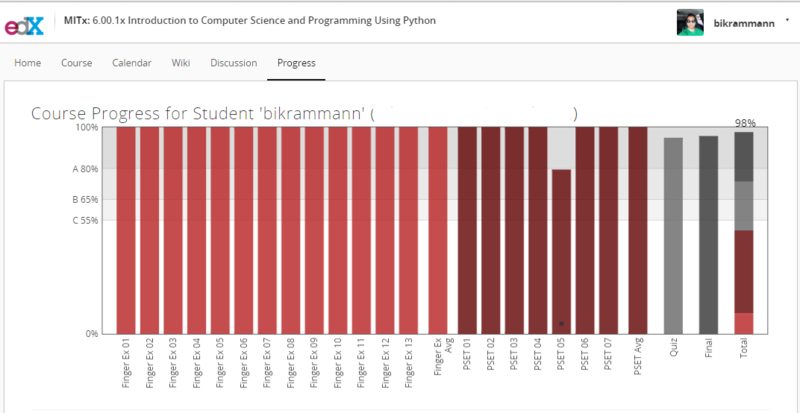 This entry was posted in edX, Python on March 16, 2016 by bikrammann.